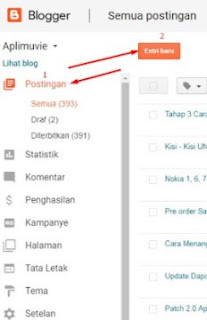 How To Make Title, Writing or The First Article on Blog - On this article I will explain about tips or steps how to write an article in blog in order that your article be reserved by Google Bot or permanent Index. 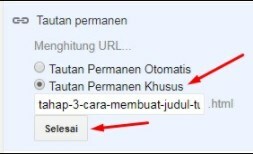 Actually, writing an article is very easy but to be reserved by google search engine is not as easy as we think. We need technique so it will be fast reserved by google webmaster. To be a real blogger is not as easy as you think, moreover she/he hopes salary, seen from many blogger story whom I lead. They still keep fighting and ways studying never stip to get good salary from google. Blogger is a writer who gives their knowledge and share it to be known by another. By writing in blogyou can get many positive things. Spread your think and improve your knowledge because you always reading reading and reading. Well, I will not waste of time which can take many sheetsifcopied in microsoft word now to the print, how to decide good tittle for reverved by google. Making suitable title which different with another. Article must be original and never written by another yet. You can use someone's article, but you must rewrite. It must be 300 words minimally. After knowing all of them, please trying making title on article. To get amazing index okease make 3-7 unique words. 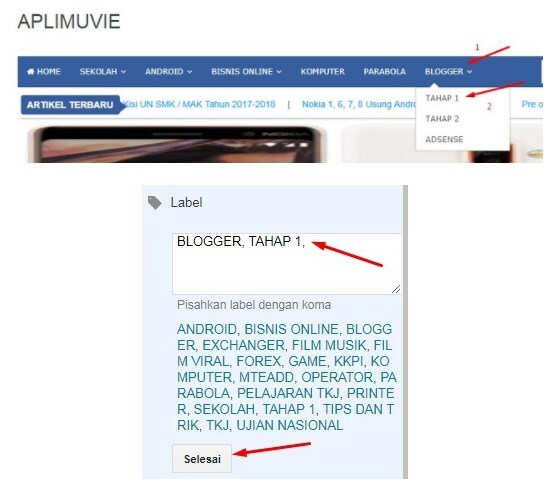 Well, above are some unique titles you can choose, make sure you find keywords that many people search, example: how to, tips, trij, spesification, solve, etc. Here, is it clear or do you still have question or confused? If you have question or do not understand yet we can discuss in my group so you can easily practising this step on your article. 3. Please decide your title as the example below, after that the instruction to insert picture, video and link you want to copy in your blog. 4. 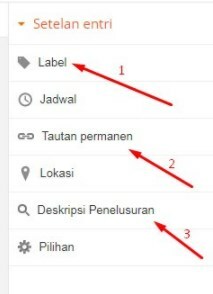 After writing 300 word minimally, you can publish, before your publish better youlook at in setelan entri or entry setting, there are 3 entry which need your attention thise are label, tautan permanent, and deskripsi penelusuran (search description). They are very important for reserved by Google Bot. 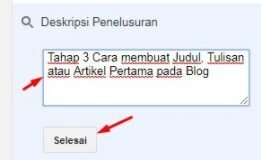 For Deskripsi penelurusan (search description) you can insert tittle you have written example: the third step, how to make tittle, Writing or the first article on Blog. If you have finish please press finish as the following example. Finish and you can publish now adter you fit it all. Then press publish. That's all from me, may it will be useful for us, for the fourth meeting I will explain how to insert Link, picture, and video. See you...!! !